Major party candidates are winning counties by larger margins, displaying the increased rural-urban divide in the U.S., reports David Wasserman of FiveThirtyEight. That means "purple America" is becoming a thing of the past, replaced by counties that are either red or blue. It's not a new phenomenon. Bill Bishop, who inspired The Rural Blog, wrote in the 2008 book, The Big Sort: Why the Clustering of Like-Minded America is Tearing Us Apart, that people increasingly flock with others who share similar socioeconomic profiles and politics, leading to rural areas becoming more conservative and cities more liberal. The rural-urban divide has continued to grow, as evidenced by the 2016 presidential election, where Donald Trump was overwhelmingly popular in rural areas, while Hillary Clinton won most of the major urban areas. Wasserman notes that "61 percent of voters cast ballots in counties that gave either Clinton or Trump at least 60 percent of the major-party vote," up from 50 percent in 2012 and 39 percent in 1992. "Of the nation’s 3,113 counties (or county equivalents), just 303 were decided by single-digit margins—less than 10 percent," compared to 1,096 in 1992, "even though that election featured a wider national spread," Wasserman writes. 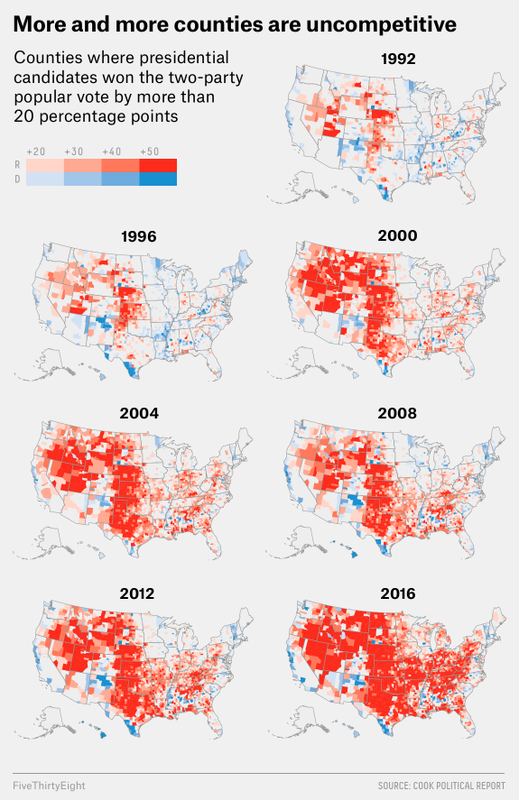 "During the same period, the number of extreme landslide counties—those decided by margins exceeding 50 percentage points—exploded from 93 to 1,196, or over a third of the nation’s counties." House Republicans' replacement for Obamacare would repeal in 2020 the requirement that substance abuse and mental-health care be covered under Medicaid expansion. That could have a disproportionate impact in rural areas, where such services tend to be less accessible already. "The proposal would also roll back the Medicaid expansion under the act — commonly known as Obamacare — which would affect many states bearing the brunt of the opiate crisis, including Ohio, Kentucky and West Virginia. 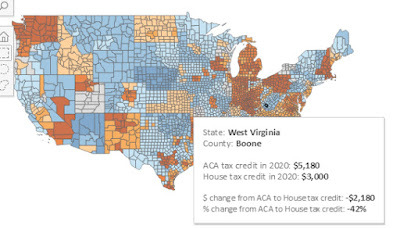 Thirty-one states and the District of Columbia expanded Medicaid under the ACA," report Katie Zezima and Christopher Ingraham of The Washington Post. "Advocates and others stress that mental-health disorders sometimes fuel drug addiction, making both benefits essential to combating the opioid crisis. . . . Republicans on the committee argue that the change would give states additional flexibility in coverage decisions, and believe they would continue to provide addiction and mental-health coverage to Medicaid recipients if needed." However, President Trump has vowed to expand drug treatment, and "Several Republican senators expressed concern about removing the benefits. Sens. Rob Portman (Ohio), Shelley Moore Capito (W.Va.), Cory Gardner (Colo.) and Lisa Murkowski (Alaska) sent a letter to Senate Majority Leader Mitch McConnell (R-Ky.), stating that the plan does not 'provide stability and certainty' for individuals and families enrolled in Medicaid expansion programs, or flexibility for states," the Post reports. The reporters note, "Nearly 1.3 million people receive treatment for mental-health and substance abuse disorders under the Medicaid expansion, according to an estimate by health care economists Richard G. Frank of the Harvard Medical School and Sherry Glied of New York University." Frank told the Post that dropping addiction treatment services for low-income people is especially harmful, because they are more likely to abuse drugs. "He said Medicaid recipients who are covered for addiction treatment and maintain their coverage through 2020 would not lose the benefit under the GOP proposal. But, he added, because addiction is a chronic-relapse disease, people may get clean, relapse, stop working and need to go back on Medicaid," the Post reports. UPDATE: The public-notice bill has been referred for study during the interim between legislative sessions. The fight to keep public notices in newspapers across the United States has come to Arkansas. "HB 1836 filed late last week seeks to remove the requirement for cities and counties to publish their public notices in newspapers and allow them to post the public notices on their respective websites," the Arkansas Press Association reports in its Arkansas Publisher Weekly. The measure comes after a host of other bills that are picking away at the state's Freedom of Information Act, which celebrated its 50th anniversary on Feb. 14. 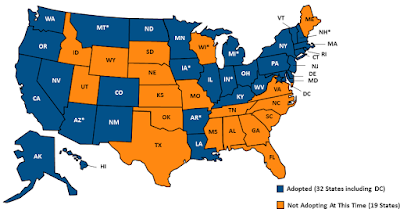 APA Executive Director Tom Larimer said in his column that the language of HB 1836 has been introduced before and the arguments against it are still the same: "Internet connectivity remains sparse in large portions of the state. Posting these public notices to a web site would disenfranchise a large chunk of Arkansas’ population." He added, "If the goal is to put public notices online, they are already online." The bill, sponsored by Rep. Karilyn Brown of Sherwood, is expected to be discussed on the House City, County and Local Affairs Committee agenda next week, APA reports. Local governments around the country are asking state legislatures to roll back public-notice requirements, arguing that the move would save money. Newspapers argue that few people read government websites. Sunshine Week, which celebrates open government, is from March 12-18. Trump called community banks "the backbone of small business in America," said they "play a vital role in helping create jobs by providing approximately half of all loans to small businesses," and "Nearly half of all private sector workers are employed by small businesses." Bloomberg reports, "One way in which Trump favors re-regulation of financial institutions is his support for restoring the Glass-Steagall, which since the Depression had separated commercial and investment backing until its repeal under President Bill Clinton in 1999. White House Press Secretary Sean Spicer told reporters Thursday that Trump remains committed to reimposing the act’s restrictions on banks, a position shared by prominent liberals." Community banks want relief from the Dodd-Frank Act, "a sweeping overhaul of U.S. banking regulation put in place after the financial crisis of 2008," reports Bloomberg. "For banks with less than $50 million in assets, a 2013 study by the Federal Reserve Bank of Minneapolis found that adding two employees to handle compliance would cause nearly a third of those banks to become unprofitable." 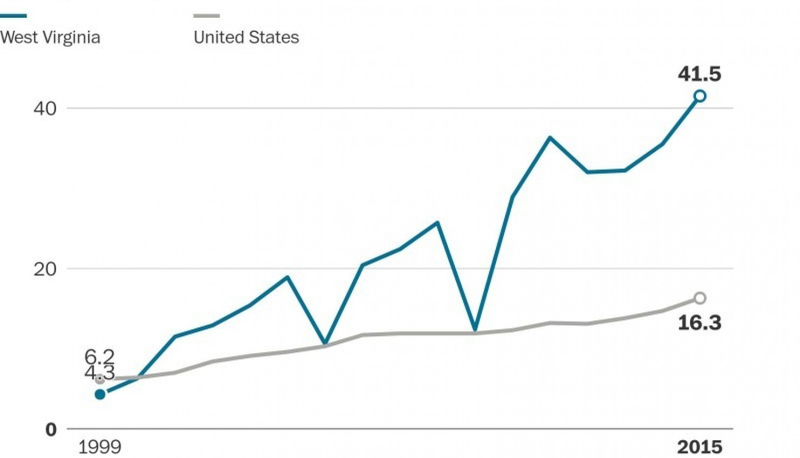 On top of Dodd-Frank, "Persistently low interest rates have squeezed profitability from community banks’ business models: collecting more interest from borrowers than they pay for deposits," Bloomberg reports. "A slew of new regulations have also hobbled key sources of non-lending income, including the fees some banks can charge retailers and other businesses for processing card transactions. Many regional and local lenders are combining to reduce costs." 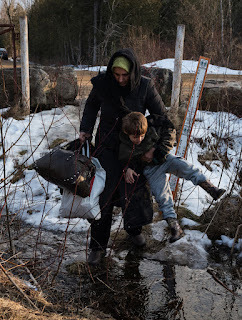 The mayor of Rutland, Vt. (Best Places map), blames the resounding loss of his bid for a sixth term Tuesday on his support for bringing Syrian and Iraqi refugees into the town of 16,500, Wilson Ring reports for The Associated Press. Chris Louras, mayor for 10 years, got only 33 percent of the vote, losing handily to City Councilman David Allaire, who earned 51 percent. Louras had twice beaten Allaire by large margins. "Last spring, Louras announced a plan to bring up to 100 refugees annually from Syria and Iraq to the city," AP reports. "The plan split the community, with many residents eager to greet the newcomers but with others citing concerns the refugees could be security threats or economic burdens. So far, two families, both with young children, have arrived." In an editorial the Rutland Herald argues that the issue wasn't refugee resettlement—four of the six candidates supported it—but the way Louras presented it. "Where Louras got into trouble was in trying to couch resettlement as an economic-development opportunity for Rutland—that inviting people from afar to settle in our fair city would change the culture and lead to ethnic diversity, and that in turn would spur economic growth and enrich the lives of people who are already here. Listening to him talk, the mayor sometimes made it sound like Rutland’s bigger problem is that the city has too many jobs just waiting to be filled. That didn’t square with most people’s economic reality, and it cost Louras credibility, even among people who had no particular objection to inviting 100 or so refugees to relocate to Rutland." The editorial continued, "The way the mayor went about it didn’t help his standing, either. Rather than engaging the community in a dialogue beforehand, by the time resettlement was rolled out a lot of people felt it was cast as a done deal, with the implicit message that you either backed the mayor or you were wrong. That’s hardly a recipe for getting yourself re-elected, and it ignored the fact that not everyone who questioned the wisdom of the program, or the lack of transparency in the process, was a raving xenophobe." Farm Foundation Forum on NAFTA's future Tues. The topic of the next Farm Foundation Forum, on Tuesday, is "The Future of the North American Free Trade Agreement." Scheduled from 9-11 a.m. ET, the forum will be held at the National Press Club in Washington. It will be available via audiocast and archived on the Farm Foundation website. The deadline to submit a proposal to present at the 2017 National Forum to Advance Rural Education is April 14. The theme of this year's forum, which will be held from Oct. 12-14 in Columbus, Ohio, is "Growing Success." The forum "will focus on connecting education and work, strengthening the profession, and supporting the whole child," says a release from Battelle for Kids, which is co-hosting the event with the National Rural Education Association. "More than 40 percent of all American schools are in rural areas, and close to one third of all students in the country attend rural schools," said Battelle for Kids. "For most rural school districts in this country, collaboration is not a choice, it is a necessity. Collaboration helps to elevate the voice of rural districts, uplift and empower isolated educators, administrators, and students, and leverage limited resources to tackle big issues. This event brings hundreds of rural education leaders and practitioners together to learn, network, and collaborate on the topics at the forefront of rural education." Tom Rosenstiel spoke to an audience at the University of Kentucky Wednesday. Journalism needs to adjust to the new era of social media, and it can do that without changing its essential principles, but the public needs to help, the executive director of the American Press Institute said Wednesday at the University of Kentucky. Tom Rosenstiel, co-author of The Elements of Journalism: What News People Need to Know and the Public Should Expect, spoke at the latest installment of the UK School of Journalism and Media's "Challenges to Journalism" series. Using the book as a template, Rosenstiel discussed how elements and principles of journalism have been affected by social media and other technologies, and how journalists can adapt. But the Elements also say that "Citizens, too, have rights and responsibilities when it comes to the news,: and he said the role of citizens as consumers of journalism "probably is the issue that has exploded the most." "In effect we are our own editors" as we use social media, Rosenstiel said, but Facebook is programmed to give us information that its algorithms suggest interest us, which may steer us away from views contrary to our own. "Whether we are in a filter bubble is dependent on us." Readers, listeners and viewers once used their judgments about news sources as a filter for news, but on social media that branding is largely lost, and the news becomes "atomized," story by story, Rosenstiel said, with little emphasis on the original source. Social media thus lack an essential element of journalism, the "discipline of verification." Rosenstiel explained that the discipline calls for "objectivity of method, not neutrality," because individuals cannot be expected to be truly objective. The objectivity of method, driven by what journalist-philosopher Walter Lippmann called "a scientific spirit . . . is actually the antidote to fake news," Rosenstiel said. "We are in the era of show-me news: 'Show me why I should trust you.'" He said that is done by making the evidence in a story, and the sources for it, clear and transparent. "The key element is the reporting and the evidence, not a beautiful narrative." The elements or principles that journalists "must maintain an independence from those they cover" and be "an independent monitor of power" are "under siege from various pressures," Rosenstiel said, including the proliferation of news outlets that are more about "the journalism of affirmation" of news consumers' beliefs. "Audiences like to see news they agree with." Journalists need to understand that in many cases they are no longer the gatekeepers for information, but "annotators of information we've already heard," Rosenstiel said, which makes it more important for them to check facts, knock down rumors and help readers make sense of events, trends and issues. He also said it's more important than ever to put labels like "analysis" on stories that go beyond the facts. Rosenstiel said "the area of greatest challenge" for journalism may be its need to "provide a forum for public criticism and compromise," because the "commenting media" are growing while "the reportorial media" are shrinking and looking for more revenue from the audience to make up for less advertising. That is making a real difference in many states and localities, as congressional delegations and local governments and get less coverage, Rosenstiel said. "We often overlook the importance of reporters simply showing up," he said. "Bad things happen when people in power think they're not being watched." How about other Elements of Journalism? 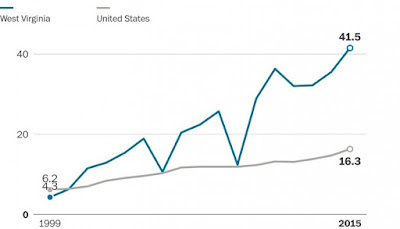 "Its first loyalty is to citizens:" As news organizations' finances have eroded, its loyalty to citizens has been weakened, with more use of sponsored content, and "This is something we need to worry about," Rosenstiel said. "Make the significant interesting and relevant:" It's more important to listen to the audience, Rosenstiel said, because the web and economics are moving the market away from "publications of record" to "publications of interest." The web rewards specialization, not the old model of general-interest stories, so local publications "need to decide the few things they need to get better at." One encouraging finding is that people will still read long stories, especially at night and on mobile devices, he said. "Keep the news comprehensive and proportional:" With fewer resources, we "need to think about comprehensiveness within topic," Rosenstiel said, keeping in mind that "The function of news is to create community knowledge." Journalists should "exercise personal conscience:" Rosenstiel said research shows that the expansion of news outlets have drawn conservatives out of traditional newsrooms, so editors and publishers need to think about ideological, class and cultural diversity. Are ethics violations against Sonny Perdue holding up Senate confirmation hearing for ag secretary? One of the reasons for the delay in a Senate confirmation hearing for former Georgia Gov. 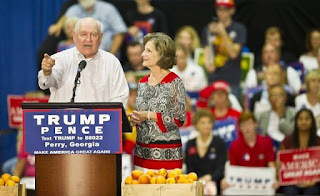 Sonny Perdue for agriculture secretary could be prior conflicts of interest leveled against Perdue while he was governor, Eric Lipton and Steve Eder report for The New York Times. The hearing has been delayed while a background check is completed. President Trump picked Perdue for the position six weeks ago, but it is one of the few Cabinet positions yet to have a confirmation hearing scheduled. Perdue, who took an ethics pledge when elected governor, was accused of failing to honor the pledge during his eight years as governor, reports the Times. "The criticism centers on the fact that, as Trump has, he continued to own or help run his family business ventures—four farming-related companies—while serving as governor." Perdue was governor from 2003-11. While in office, 13 complaints were "filed against Perdue with the State Ethics Commission, which on two occasions ruled that the governor had violated state ethics laws," reports the Times. "The commission took the unusual step of fining Perdue while he was governor. There were numerous other questions, including some about the role of Perdue’s personal lawyer—also a state legislator—in pushing a bill through the legislature that included a special provision that gave Perdue $100,000 in state tax relief." "And, when his tenure as governor was coming to a close, Perdue met with Georgia officials who oversee the state’s ports to discuss use of a terminal for a family business, according to documents obtained by The Atlanta Journal-Constitution," reports the Times. "Soon after he left office, in fact, he opened a new company that specialized in exporting products through Savannah." 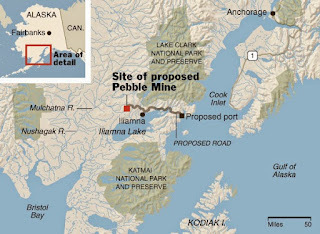 The controversial Pebble Mine project in Alaska that has been in the works for years, but until recently was thought to be all but dead, might now have a chance at a comeback with Donald Trump in the White House, Tim Sohn reports for The New Yorker. In 2014 Northern Dynasty Minerals, a Canadian mining company, marked the location of about 1,300 exploratory holes revealing huge deposits of copper, gold, and molybdenum worth potentially hundreds of billions of dollars. The project, located "right near the headwaters of some of Bristol Bay’s major salmon rivers," has "encountered stiff opposition from local fishermen, Alaskan Native groups, and their environmental and political allies around the country," Sohn writes. "Early last year, the combination of bad PR, spooked investors, declining copper prices, logistical and infrastructural challenges, unresolved court battles, and a proposed intervention by the Environmental Protection Agency seemed to have rendered Pebble an extreme long shot. Northern Dynasty’s stock, worth twenty-one dollars a share five years earlier, bottomed out at twenty-one cents." "On Nov. 9, the day after Donald Trump won, Northern Dynasty’s share price jumped twenty-five per cent; by early February of this year, it had more than quadrupled in value," Sohn writes. "Soon the company was being touted as a virtual sure thing in investor newsletters and chat rooms—'Trump’s gold' became a popular refrain." 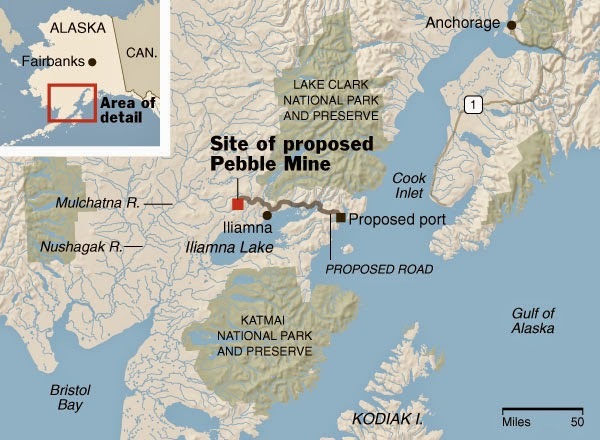 While "Republicans in Congress have long seen Pebble as a casualty of the EPA’s regulatory overreach, the Trump Administration has made no public statements concerning the mine, nor has it had any direct contact with Northern Dynasty." The mine is unpopular in Alaska, and only getting more so, Sohn writes. Gov. Bill Walker, an independent, "has spoken out against the mine, and the GOP-dominated state legislature has grown increasingly skeptical—a particularly important development, since a 2014 ballot measure, supported by two-thirds of voters, gave it veto power over any mine proposal in Bristol Bay." The number of undocumented immigrants caught in February trying to enter the U.S. from Mexico dropped significantly, suggesting that President Trump's tough immigration stance may already be having a positive impact on illegal border crossings, Nicholas Kulish and Fernanda Santos report for The New York Times. Data from Customs and Border Protection shows that about 840 people were stopped per day in February, down 39 percent from January and 36 percent from February 2016, reports the Times. Typically the number of apprehensions increases in February as the temperature in the Southwestern U.S. begins to rise. Mark Krikorian, executive director of the Center for Immigration Studies, a Washington-based group that favors more limits on immigration, "said all signs pointed to a decline in migration similar to that seen after the Reagan administration’s sweeping immigration reform law of 1986," reports the Times. Efforts have been made in Appalachian to revitalize local economies through means other than coal. One such project is a planned $50 million high-tech greenhouse on 70 acres of reclaimed mining land in Eastern Kentucky that could provide up to 130 full-time jobs, Jere Downs reports for The Courier-Journal in Louisville. The greenhouse would be located in Pikeville, Ky. (Best Places map) which has an unemployment rate of 8.7 percent, well above the state average of 4.5 percent. The greenhouse "would grow tomatoes, bell peppers and other vegetables under glass," said AppHarvet CEO Jonathan Webb, who said he is raising funding from angel investors and expects to break ground in June, Downs writes. The project would include a 45-acre hydroponic greenhouse. "Covering two million square feet, the greenhouse can produce 2.6 million pounds of vegetables annually." The greenhouse has gotten the support of Republican Gov. Matt Bevin, who said, "This project presents a fantastic opportunity to help our Appalachian region continue its rejuvenation," Downs writes. The project also has received "preliminary approval for $2.5 million in state tax incentives from the Kentucky Economic Development Finance Authority." Inmate Rick Kline works in the program. A federally funded program in Arizona allows inmates and wild horses to get a second chance, Shania Alba, of Cronkite News, reports for a story that appears on the Daily Yonder. 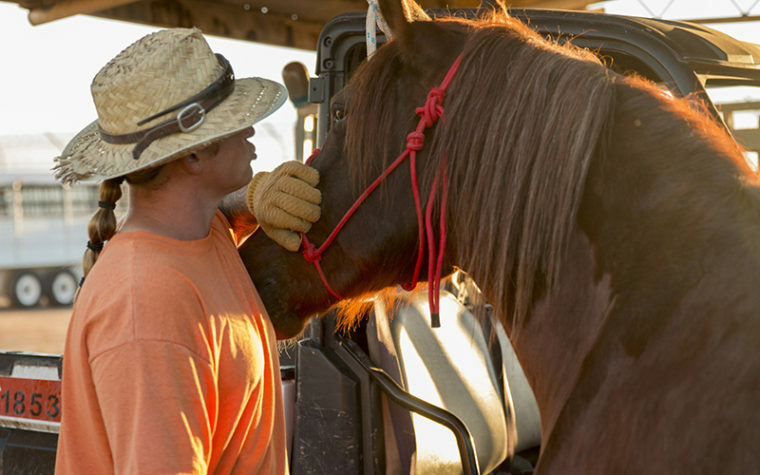 Inmates at the Arizona State Prison in Florence, about 50 miles southeast of Phoenix, are caring for and training wild horses to prepare them for adoption in the hopes of reducing the wild horse population and prevent overgrazing. The program is funded and run by the Bureau of Land Management and annually provides "about 120 wild horses and burros for adoption." "First, the animals need to be domesticated after they’re transferred from a holding facility. Inmates train and care for the horses and burros for three or four months at the prison," Alba writes. "Inmate 'handlers' start 'rehabilitating' horses and burros every morning before the sun rises, working until the early afternoon over several weeks to get the animals used to people. The interaction with the animals is a series of steps, moving from teaching basic commands such as getting the horse to stand still during grooming to placing saddles and harnesses on them, then allowing people to ride them." The program has not only helped to rehabilitate wild horses, but prisoners as well, Alba writes. Randy Helm, a BLM-appointed supervisor, "said recidivism is low, with only two prisoners in the program having returned to the Florence facility over five years." 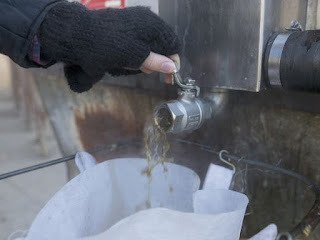 An unusually warm winter in Michigan is wrecking havoc on the state's multi-million dollar maple syrup business, Ken Palmer and Ann Zaniewski report for the Lansing State Journal and Detroit Free Press. Warmer weather has shortened the season, making it difficult for maple sap producers to decide on the best time to tap trees. If they do it too early they "miss the best flows if conditions are better later." If they wait too long they could miss the best sap. "Once trees start budding, the quality of the sap quickly declines." As a result of the warmer winter, "some producers are collecting less sap than in previous years, or having to use more to make the same amount of maple syrup," Palmer and Zaniewski write. Temperatures in Michigan in February were well above normal, averaging in the high 30s for most of the state for the month, with record-breaking temperatures reaching in the 60s and 70s on same days. "Ideal weather for sap flow is when temperatures are below freezing at nighttime and above freezing in the 30s and 40s during the day. When the weather is well above freezing both day and night, the sap can run to tops of the trees." Michigan produced between 90,000 to 148,000 gallons a year over the past four years, Palmer and Zaniewski write. "The season typically lasts four to six weeks. March is usually the sweet spot. This year, some producers in southern Michigan tapped as early as late January." Analysts say House Republicans' bill to replace the Patient Protection and Affordable Care Act could cost millions of people to lose health insurance and would largely hurt people in areas where coverage is high, predominately rural areas where there are few hospitals or few insurers, Abby Goodnough and Reed Abelson report for The New York Times. "Starting in 2020, the plan would do away with the current system of providing premium subsidies based on people’s income and the cost of insurance where they live. Instead, it would provide tax credits of $2,000 to $4,000 per year based on their age," reports the Times. "But the credits would not cover nearly as much of the cost of premiums as the current subsidies do, at least for the type of comprehensive coverage that the Affordable Care Act requires, analysts said. For many people, that could mean the difference between keeping coverage under the new system and having to give it up." "The proposal would also eliminate another important element of the subsidies, the financial assistance available for low-income people with their out-of-pocket costs, such as deductibles and co-payments," reports the Times. "While many of the plans now sold through the Affordable Care Act marketplaces have large deductibles, the cost-sharing reductions available protect lower-income people from medical bills that could otherwise run into the thousands of dollars. Analysts say the lack of out-of-pocket assistance is likely to make any plan much less attractive to low-income people." "Legislation could also fundamentally weaken the insurance market by doing away with the so-called individual mandate, which requires people to have coverage or pay a tax penalty," reports the Times. "While it would be replaced by a 30 percent surcharge when someone buys a policy after dropping coverage, the surcharge could be weaker than the current mandate, and younger people might continue to gamble on not having coverage until they get sick. The result, said Donald H. Taylor Jr., a health policy professor at Duke University, is that people who buy coverage are sicker, causing the cost of premiums to soar." Proposed budget and employee cuts to the Environmental Protection Agency could have the opposite effect of aligning with the Trump Administration's goal of reducing regulatory burdens, Marc Heller reports for Greenwire. Cutting EPA's budget by 25 percent and its employees by 20 percent would mean fewer employees, leading to delays in actions such as pesticide approvals that farmers and agribusinesses are anxiously waiting on. "All registered pesticides are required under the Federal Insecticide, Fungicide and Rodenticide Act to undergo reviews by EPA every 15 years," Heller writes. "As of last year, the agency reported more than 700 registration review cases involving more than 1,000 active ingredients; more than 500 cases were in 'active review.' New chemicals undergo extensive reviews by the agency before they can be registered, as well." Arkansas Republican Gov. Asa Hutchinson is seeking to lower eligibility for Medicaid under the Patient Protection and Affordable Care Act to 100 percent of the federal poverty line—it is currently 138 percent—which would move about 60,000 Arkansas residents, many of them rural, to the subsidized insurance marketplace, Maggie McNeary reports for Arkansas Online. In Arkansas, which was one of the few southern states that expanded Medicaid, more than 300,000 people are on the program. Hutchinson "said this new cap would ensure that the people affected would retain their coverage, save money for the state and encourage personal responsibility," McNeary writes. He "said he believes the change brought about by the waivers is the same direction national health care will take" and that Arkansas can serve as a model for other states and the federal government. Hutchinson also wants to add a work requirement. Higdon writes, "Even if every one of Obama’s environmental regulations—the Mercury and Air Toxics Standards; the Cross State Air Pollution Rule; the Coal Ash Rule; the Effluent Limitations Guidelines for wastewater discharge, and section 316(b) of the Clean Water Act —were all struck down tomorrow, the effect on jobs in Appalachia would still be negligible. That’s because global demand for coal is slowing, and coal from Wyoming costs a fraction of the coal from Appalachia. 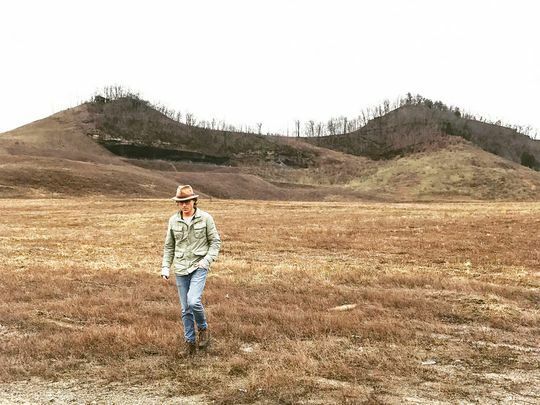 Even without the Stream Protection Rule, the Appalachian economy still needs to be remade." While Republicans have blamed Obama for coal's downfall, one of the best ideas to revive the industry was actually proposed by his administration, Higdon writes. "As part of the 2016 budget, the Obama White House created something called the POWER Plus plan," which "proposed converting $1 billion from the Abandoned Mine Lands fund—a pot of money that had been growing since the Carter administration—into economic-development grants to the states with the most abandoned mines. For Kentucky alone, that would mean $20 million a year for five years. The money would likely have gone to promote other businesses sectors like manufacturing and tourism and to retrain miners for new jobs like writing computer code." "This potential windfall was met with disinterest, if not skepticism, in the Republican-controlled Congress," Higdon writes. Jason Walsh, a senior policy advisor at the Domestic Policy Council in Obama’s White House who helped craft the plan, told him, “When we included the proposal, no Republican member of Congress was willing to touch it at first." Rep. Hal Rogers, a Republican who represents most of Eastern Kentucky, and who has been a strong critic of Obama, saw Obama's plan as a good opportunity to revive coal communities and introduced it as the RECLAIM Act to the House in 2016—"a stand-alone bill to convert $1 billion of the Abandoned Mine Lands into economic development grants for hard-hit Appalachian areas," Higdon writes. It never went anywhere and now "it remains an open question whether this Congress will finally find a productive use for that $1 billion that is sitting largely untouched in the federal coffers." Ralston in January called for a "rural-development initiative" in response to rural concerns, such as shuttered businesses, hospitals that have closed or are financially struggling, poor internet connections, young people migrating to cities and never coming back and schools that don't offer all the classes students need to get into the University of Georgia or Georgia Tech, Lee wrote in a previous story. Of the 80 rural hospitals that have closed since 2010, six are in Georgia. That places the state third behind Texas and Tennessee. Iowa is hoping to assist in the recovery of monarch butterflies by educating its citizens about the species, Donnelle Eller reports for The Des Moines Register. A group called the Iowa Monarch Conservation Consortium, which consists of nearly 40 agriculture, conservation, business, utility and government groups, has released a 135-page plan that "helps provide farmers, backyard gardeners and others with a road map for boosting monarch butterfly habitat in Iowa." 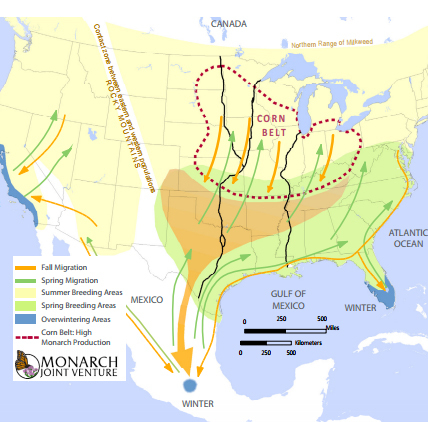 Conservationists say the majority of the world's monarchs originate in the Corn Belt. 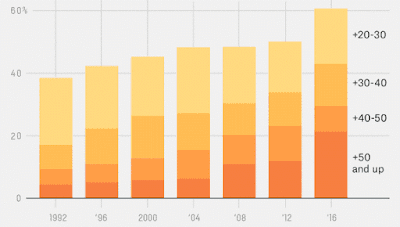 Monarch numbers fell 90 percent in recent years after reaching 1 billion in 1996. Insecticides and illegal logging in designated habitats are largely blamed for destroying milkweed plants, which are the main source of food for the butterflies. Last year the U.S. Fish and Wildlife Service started a conservation fund for the butterfly and also announced the first round of grants totaling $3.3 million from the fund. "In 2014, environmental groups petitioned the Fish and Wildlife Service to protect monarch butterflies under the Endangered Species Act," Eller writes. "The service has until June 2019 to determine whether to add Monarch butterflies. The petitioners say farming in the Midwest is among the reasons for monarch's decline. The petition points to the 'nearly ubiquitous adoption' of glyphosate-resistant corn and soybeans for causing 'a precipitous decline of common milkweed, and thus of monarchs, which lay their eggs only on milkweeds.'" The Iowa consortium includes agri-businesses Monsanto, Bayer, DuPont-Pioneer and Syngenta, Eller writes. The Iowa Office of Farm Service Agency said "about 623,000 acres in Iowa are planted to pollinator habitat through four federal conservation programs. Altogether, Iowa farmers and landowners received $293 million last year to create nearly 1.9 million acres of pollinator habitat. Farmers kicked in $55.3 million." House Republicans' bill to replace the Patient Protection and Affordable Care Act has "a more conservative vision for the nation’s health-care system, replacing federal insurance subsidies with a new form of individual tax credits and grants to help states shape their own policies," Amy Goldstein, Mike DeBonis and Kelsey Snell report for The Washington Post. "Under two bills drafted by separate House committees, the government would no longer penalize Americans for failing to have health insurance but would try to encourage people to maintain coverage by allowing insurers to impose a surcharge of 30 percent for those who have a gap between health plans," reports the Post. "The legislation would preserve two of the most popular features of the 2010 health-care law, letting young adults stay on their parents’ health plans until age 26 and forbidding insurers to deny coverage or charge more to people with preexisting medical problems." On the Medicaid expansion, which has been especially important in rural areas, the bill would allow states that expanded Medicaid "to continue getting federal funding as they would have under the ACA, until 2020," The New York Times reports in a side-by-side comparison of the bill and current law. "Federal funding for people who become newly eligible starting in 2020 or who leave the program and come back, however, would be reduced. The bill also proposes capping federal funding per enrollee, based on how much each state was spending in fiscal year 2016." After 2020, Medicaid would become a block-grant program. "States would no longer receive an open-ended federal match," USA Today's Maureen Groppe reports. "They would be given a set amount based on the number of enrollees." As health-care costs rose, states would have to cut services or find other sources of revenue to support them. For private insurance, "The tax credits outlined by the Ways and Means Committee’s portion of the legislation incorporate an approach that Republicans have long criticized: income-based aid to help Americans afford health coverage," reports the Post. "Until now, the GOP had been intending to veer away from the ACA subsidies that help poor and middle-class people obtain insurance, insisting that the size of tax credits with which they planned to replace the subsidies should be based entirely on people’s ages and not their incomes. But the drafts issued Monday proposed refundable tax credits that would hinge on earnings as well as age—providing bigger credits for older and poorer Americans." The bill would cut taxes on wealthy, eliminating "a 3.8 percent investment tax on the well-to-do that Democrats had used to help finance the health-care law, as well as a 0.9 percent surcharge on wages above $250,000," Brian Faler reports for Politico. Also, the bill would eliminate the $500,000 cap on the amount of salary that insurance companies can deduct as a business expense, "so the more insurance companies pay their executives the less they will pay in taxes," Hohmann reports. But the bill still has no score from the Congressional Budget Office, so "We don’t know how many people will lose coverage or how much this might blow up the deficit over time," Hohmann points out. But some conservatives see a big price tag coming; Sen. Rand Paul of Kentucky called the bill "Obamacare lite." Since Donald Trump was elected president, a growing number of Muslims have been illegally crossing the border into Canada, Todd Heisler reports for The New York Times. The town of Champlain, a rural corner in upstate New York known as the North Country, "just a brief detour from a major border crossing on Interstate 87, has become one of the busier illegal points of entry." Chris Crowningshiele, a longtime cab driver, said until recently most of his fares in the Plattsburgh, N.Y. area were students or Walmart shoppers, Heisler writes. He said he now picks up passengers at the airport or the bus station, "and over the 25-mile drive north, they have told him that they had traveled from across the country. Some were migrants from Yemen and Turkey. They confided that they were fearful, of what was happening in the countries they wanted to leave behind—not just their homeland but now also the U.S.—and of what they faced once they stepped out of Crowningshiele’s cab." Crowningshiele’s taxi is one of a "steady stream of cabs" taking people to the border, Heisler writes. "This is not exactly Trump Country. In Clinton County, which includes Champlain, Hillary Clinton eclipsed Trump by 610 votes. Many residents on Roxham Road said they did not bother to vote and had followed politics just enough to feel disenchanted, if not disgusted." Legal marijuana has helped revitalize a struggling rural Oregon town, but has led to controversy just across the border in Idaho, where the drug remains illegal, Sven Berg reports for the Idaho Statesman. The arrival of "green gold" has led to a mini-boom in Huntington, Ore., a town of 435 that has seen its population dwindle as businesses closed shop. Now, "City Hall might reap enough tax money from marijuana and related sales to double the city’s $200,000 budget," Berg writes. Also, an influx of Idahoans crossing the border to buy marijuana has boosted the economy and helped local business, such as restaurants and stores, who serve marijuana customers while they wait for orders to be filled. But all is not well 30 miles southeast of Huntington: in Idaho, where marijuana is illegal and Republican Gov. Butch Otter, who has challenged President Trump "to reverse his predecessor’s failure to enforce federal marijuana laws," said he "is sick of neighboring states flouting the federal government’s ban of the drug," Berg writes. On Feb. 24, "12 of 14 cars parked at 420Ville, one of Huntington’s two dispensaries, had Idaho license plates." Elisha Figueroa, who leads Idaho’s Office of Drug Policy, "said legalizing marijuana in Oregon is like illegally polluting rivers or the air in a way that damages neighboring states," Berg writes. "Unlike pollution, marijuana mostly affects the people who are breaking the law. But the public is on the hook for law enforcement, incarceration and public health costs. Figueroa pointed to studies that found a variety of marijuana-related safety and public health problems have surfaced in states where the drug is legal." She told him, “All of these things cost taxpayers an enormous amount of money because of the bad decisions of our neighboring states." Iowa, Kansas, Oklahoma, North Dakota and South Dakota now get at least a fifth of their electricity from wind energy, Daniel Cusick reports for Climatewire. Data from the U.S. Energy Information Administration shows that Iowa gets 36.6 percent of its electricity from wind, South Dakota 30.3 percent, Kansas 29.6 percent, Oklahoma 25.1 percent and North Dakota 21.5 percent. The next highest state is Vermont, 15.4 percent. The U.S. total is 5.5 percent. By virtue of having smaller populations, Iowa, Kansas, Oklahoma, North Dakota and South Dakota "now claim cleaner power portfolios than many larger, greener states—including California, where renewable energy has long been a government priority," Cusick writes. From 2015 to 2016 wind share's total electricity generation grew by 6.7 percent in Oklahoma, 5.5 percent in Kansas and 5.1 percent in Iowa. Texas leads the nation in overall wind power produced, but its overall share is 12.6 percent, placing it 11th behind the top five states and Colorado, Idaho, Maine, Minnesota and Vermont. Last year, Iowa became the first state to generate more than one third of its electricity from wind. "According to EIA, turbines operating in 40 states generated a record total of 226 million megawatt-hours of electricity during 2016, approximately four times the amount of power produced by solar panels and approaching what hydroelectric dams generated," Cusick writes. The American Wind Energy Association said in a statement, "With 99 percent of wind turbines located in rural areas, wind power's steady growth as a share of the nation's electricity supply has been accompanied by a surge of investment in rural America," estimated at $13.8 billion last year. About 73,500 birds at a Tennessee farm that produces chickens for Tyson Foods had to be culled over the weekend in response to an outbreak of avian flu, "the first time the disease has struck this year," reports the Chattanooga Times Free Press. The U.S. Department of Agriculture "has not yet fully identified the specific strain of the H7 virus found at the farm" outside Fayetteville, about two hours from Chattanooga (Best Places map). USDA put a quarantine around the the affected area to test if the disease had spread, reports the Free Press. Tyson said in a statement, "All flocks located within a 6-mile radius of the farm will be tested and will not be transported unless they test negative for the virus. Based on the limited scope known to us at this time, we don't expect disruptions to our chicken business." Last year there was one reported incident of bird flu, at a turkey farm in Indiana, reports the Free Press. "A flu epidemic led to the culling of some 48 million chickens and turkeys from late 2014 through mid-2015, dealing a crippling blow to U.S. egg producers, as well as to some turkey producers and backyard poultry growers. Authorities believe migratory birds are primarily responsible for spreading bird flu, though a 2015 analysis by the USDA also described a human role in spreading the disease." So many West Virginians are dying from drug overdoses that the state is again running out of money to pay for funerals of impoverished residents, reports The Associated Press. The West Virginia Department of Health and Human Resources "sets aside about $2 million annually for burial costs for indigent people. Funeral homes are offered $1,250 to cover individual burial expenses for low-income people." 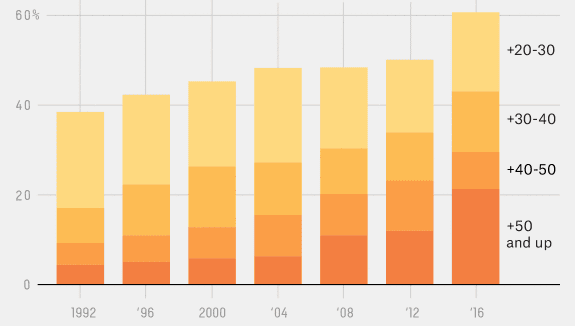 According to the federal Centers for Disease Control and Prevention, West Virginia had the nation's highest age-adjusted death rate for drug overdoses in 2014 and 2015, the last years for which rate have been computed. A state spokesperson said funeral homes have sought payment for 1,508 funerals this fiscal year, which ends June 30, and funds remain for only 63 more, Christopher Ingraham reports for The Washington Post. The program began running out of money in 2014. From 2007 to 2012, drug wholesalers shipped 780 million hydrocodone and oxycodone pills into West Virginia, where 1,728 residents fatally overdosed on the two painkillers, the Charleston Gazette-Mail reported in December. One problem is that little is done to report suspicious orders. From 2001 to June 2012 the pharmacy board received only two reports of suspicious orders. A group of more than 80 organizations have signed a statement in support of freedom of the press. The statement reads, "As organizations committed to the First Amendment right of freedom of speech and the press, we are alarmed by the efforts of the President and his administration to demonize and marginalize the media and to undermine their ability to inform the public about official actions and policies." The statment reads: "Such efforts include the President’s refusal to answer questions posed by a reporter from CNN because the President asserts it promotes 'fake news'; charges that the media 'manipulated' images of the inauguration; false accusations that the media has covered up terrorist attacks; and repeated claims that the media is 'failing' and 'dishonest.' All of this recently culminated in the President calling The New York Times, CBS, CNN, ABC, and NBC News 'the enemy of the American People!' and in the exclusion of representatives of various media outlets from a press briefing. In these and other examples, the President and his designees have attempted to villainize and discredit the press for any reporting he dislikes. However, the job of the press is not to please the President but to inform the public, a function that is essential to democracy." "The First Amendment protects the right to protest, dissent, and petition government for a redress of grievances, but these rights cannot be exercised without a free press that provides information to the public," according to the statement. "Together, these rights represent the constitutionally sanctioned method for the public to oppose government policies and activities and to seek change. The wisdom of this system can be seen in parts of the world where such a right does not exist, or is not honored, and violent opposition is the only available avenue to express opposition or remedy injustice. We condemn in the strongest possible terms all efforts by elected and appointed officials to penalize, delegitimize, or intimidate members of the press." Bruce Brown, executive director of the Reporters Committee for Freedom of the Press, one of the organizations to sign the statement, said in a statement, "Our government, and indeed our democracy, are dependent on a free and independent press that can be the eyes and ears for the people. When an administration decides to shut out reporters from a press briefing, it is taking the choice about where to get news away from the public and putting it in the hands of government. That is not press freedom. When federal prosecutors subpoena journalists to testify about confidential sources and reporting, that is not press freedom." Sunshine Week, which celebrates open government, is from March 13-19. Arkansas lawmakers last week voted in favor of several measures to limit freedom of information, Lisa Hammersly reports for Arkansas Online. On Thursday a committee advanced a bill, presented as protecting school security information from terrorists and plotters, that "would prohibit release of records 'that upon disclosure could reasonably be expected to be detrimental to the public safety.'" The bill "would exempt information from kindergartens through universities relating to the number of licensed security officers, school resource officers, or other security personnel, as well as any personal information about those individuals." Two other bills that advanced Thursday "would curb the reach of the Arkansas Freedom of Information Act focused on records pertaining to the Governor's Mansion and grounds and camera footage showing the death of any police officer," Hammersly writes. Legislators also reviewed a pending bill that "would change the current standard that requires government agencies to provide most records requests in no more than three days." It would "allow an agency to determine that a request is too large, complicated or 'burdensome' and to reply in writing with a longer time period to fulfill the request." On Wednesday the House State Agencies and Government Affairs Committee passed two measures that would "create exemptions from the public disclosure law," John Moritz and Michael R. Wickline report for Arkansas Online. Open-government advocates say one bill "would prevent records constituting attorney-client communication and attorney litigation documents from disclosure." Lawyers argued "such protection is needed to prevent opposing counsel from requesting access to notes and other legal materials while in litigation against state agencies. But opponents argued that the bill could also allow agencies to make any record secret simply by making sure it passed in front of a lawyer." Tom Larimer, executive director of the Arkansas Press Association, wrote in an editorial that President Trump's attitude towards the media is pooling over to states. He writes, "There is a decided hostile attitude toward 'the media' in general at the legislature and since technically 'we' are part of the media we’re taking the brunt. I had speculated, at least to myself, that the present animosity toward government transparency has been fueled by the present anti-media sentiment in Washington, D.C."
"I had speculated that this might be the case that some perhaps most of the current legislature, are just echoing what they’re hearing out of D.C., and it is now not so much nuanced in the Arkansas legislature as it is an openly hostile attitude," he writes. "We know going into every session that we’re going to have these fights to preserve the public’s right to know in Arkansas, but nothing could have prepare us for the open hostility we’ve encountered." Larimer, who urges journalists to keep readers informed, especially on how their elected officials are voting, wrote, "We often talk about the proverbial 'slippery slope' when it comes to amending the FOIA, meaning that once it begins it will be difficult to stop. Well, it’s not so much proverbial any more. It is a cold reality." Retired Kentucky coal miners headed to Washington last week to press Senate Majority Leader Mitch McConnell, a Republican from Kentucky, "to fix the health care fund for more than 22,000 United Mine Workers of America retirees nationwide," Curtis Tate reports for McClatchy Newspapers. Benefits are scheduled to be terminated at the end of April. A pair of Senate bills were introduced in January. Ten senators from Indiana, Missouri, North Dakota, Ohio, Pennsylvania, Virginia and West Virginia "reintroduced the Miners Protection Act, which the Senate Finance Committee approved last year but which did not make it to the Senate floor," Tate wrote at the time. Also, McConnell introduced a similar bill, with language blaming President Obama for coal's decline. Democratic Senators, led by West Virginia Sen. Joe Manchin, sent a letter dated Feb. 28 urging Senate Finance Committee Chairman Orrin Hatch (R-Utah) "to tie a permanent fix, called the Miners Protection Act, to the nomination of Robert Lighthizer to be the U.S. trade representative," Tate writes. "Lighthizer’s nomination is awaiting Senate confirmation." The letter said, “Our miners did everything we asked of them, and it is time that we uphold our end of the bargain and provide them with the permanent benefits they earned through a lifetime of work." Tate writes, "The committee approved the bipartisan bill last year, but McConnell never brought it to the Senate floor for a vote. While McConnell has offered his own bill to save the miners’ health benefits, Manchin’s bill also fixes a pension fund that even more retirees depend on. The pension and health care funds are on the brink because thousands of active union workers must support tens of thousands of retirees. Coal industry bankruptcies in recent years have reduced the contributions that coal companies are required to make to the funds." 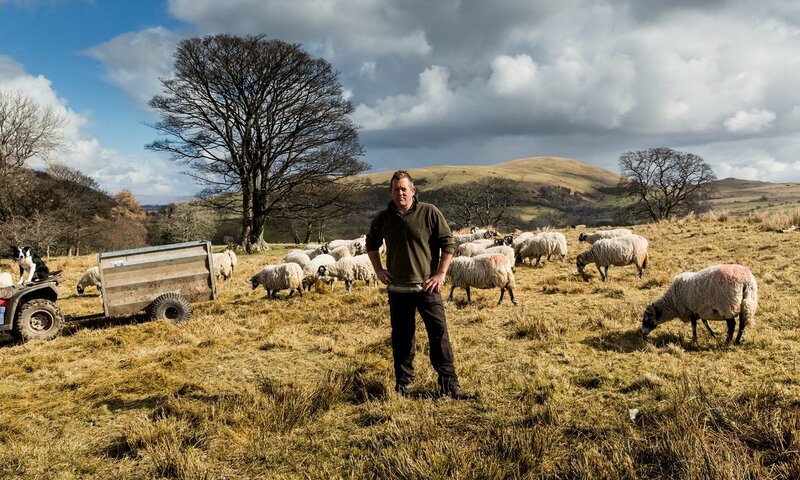 James Rebanks, a sheepherder and farmer from England who recently made his first trip to the U.S. one week before the presidential election as part of a book tour, gives his viewpoint of the state of rural America and how it affects the world in an opinion piece for The New York Times. "I was shocked by the signs of decline I saw in rural America," he writes. "I saw shabby wood-frame houses rotting by the roadside, and picket fences blown over by the wind. I passed boarded-up shops in the hearts of small towns, and tumbledown barns and abandoned farmland. The church notice boards were full of offers of help to people with drug or alcohol addictions. And yes, suddenly I was passing cars with Trump stickers on their bumpers, and passing houses with Trump flags on their lawns." "The economic distress and the Trump support are not unconnected, of course," he writes. "Significant areas of rural America are broken, in terminal economic decline, as food production heads off to someplace else where it can be done supposedly more efficiently. In many areas, nothing has replaced the old industries. This is a cycle of degeneration that puts millions of people on the wrong side of economic history." 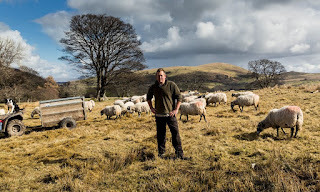 "For my entire life, my own country has apathetically accepted an American model of farming and food retailing, mostly through a belief that it was the way of progress and the natural course of economic development," he writes. "As a result, America’s future is the default for us all. It is a future in which farming and food have changed and are changing radically—in my view, for the worse. Thus I look at the future with a skeptical eye. We have all become such suckers for a bargain that we take the low prices of our foodstuffs for granted and are somehow unable to connect these bargain-basement prices to our children’s inability to find meaningful work at a decently paid job." "Our demand for cheap food is killing the American dream for millions of people," he writes. "Among its side effects, it is creating terrible health problems like obesity and antibiotic-resistant infections, and it is destroying the habitats upon which wildlife depends. It also concentrates vast wealth and power in fewer and fewer hands. Six weeks after President Trump picked former Georgia Gov. 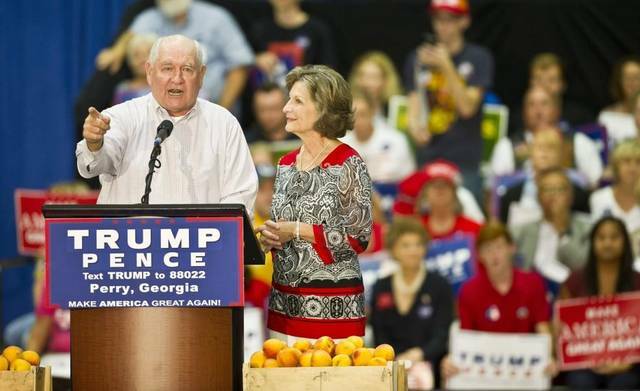 Sonny Perdue for agriculture secretary the Senate has yet to announce when a confirmation hearing will be held, Tamar Hallerman reports for the Atlanta Journal-Constitution. While Trump on Friday took to Twitter to blast Senate Democrats for the delay, the problem is that "Perdue’s paperwork has yet to technically arrive in the Senate, which means lawmakers have been unable to officially vet Perdue." "The holdup appears to be with the FBI, which is conducting a comprehensive background check that’s customary for all Cabinet nominees, according to two Republican senators and a handful of aides in the Senate and administration," Hallerman writes. "Still unclear is what is causing the slowness or whether any red flags have been raised." "Two transition officials and one White House aide not authorized to speak on the record insisted that nothing is wrong and that the delay has to do with Perdue being the last Cabinet nominee announced by the Trump administration, which put him at the back of the line as the feds screened other high-level picks," Hallerman writes. "The delay has led to frustration and some uneasiness on the part of Perdue’s allies, farm state lawmakers and Republican U.S. Rep. Pat Roberts of Kansas, the chairman of the Senate Agriculture Committee, who has underscored the need to quickly install a new agriculture head." A battle is being waged in Minnesota between farmers and conservation groups over roadside mowing that concerns "the culture of farming, property rights and the desperate plight of bees and monarch butterflies," Josephine Marcotty reports for the Minneapolis Star Tribune. "It’s put wildlife in a fierce—but so far losing—competition with Minnesota farmers for the right to the increasingly valuable grass, flowers and other vegetation that grow along 175,000 acres of state-owned roads across the state." Minnesota Department of Transportation officials say a Minnesota law that prohibits roadside mowing before Aug. 1 and after Aug. 31 is widely ignored, Marcotty writes. DOT only issues about 40 permits per year for 12,000 miles of state-owned roadway. One problem is that DOT has no power to enforce the rule or issue penalties. Landowners say they have been mowing roadside ditches and grassy shoulders for decades without government intrusion. With corn, soybeans and other crops constantly expanding, "Minnesota has lost large expanses of grass and other crops available for livestock forage," Marcotty writes. "Since 2007, the state has lost 700,000 acres of conservation land on farms plus many thousands more as high prices for corn and soybeans pushed out pastures and hedgerows." Some farmers say that has led to roadside mowing being "the only source of hay for their animals. The shift also means there is far less wild growth for pheasants, managed honeybees, wild insects and, perhaps most critically of all, monarchs, which can only reproduce on milkweed that is rapidly disappearing." The state House this week will consider a bill that would prevent the state DOT from requiring a permit to mow roadside ditches and grassy shoulders, Marcotty writes. Some fear if it passes it will lead to conflicts. Scott Peterson, government affairs director for the state DOT, said "sometimes people cut vegetation that has been sprayed with toxic weedkillers." He also said he has heard of at least one fight in a ditch "between two people who both thought they had rights to the grass." He said some people also are turning a profit off state property by selling the hay. There's a growing interest in industrial hemp production across Kentucky, drawing considerable crowd sizes to recent seminars in Christian, Clark and Shelby counties, Ryan Bowman reports The Farmer's Pride. Tom Keene, an agronomy specialist who focuses on hemp and forages for the University of Kentucky College of Agriculture, Food and Environment, told Bowman, "In 2016, according to Kentucky Department of Agriculture statistics, hemp was produced in 60 of the 120 counties and they pretty much stretched from east to west and north to south." The meetings were put on by KDA, the Kentucky Hemp Industries Association, Kentucky Hemp Research Foundation and UK Cooperative Extension Service, Bowman writes. "Topics on the agenda included hemp marketing, hemp agronomics, the KDA’s Industrial Hemp Research Pilot Program and KDA policies." 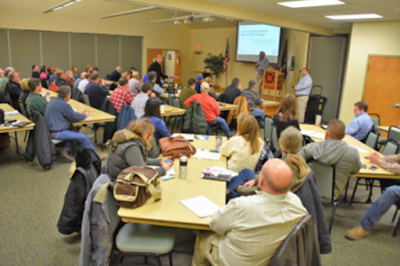 Recent seminars in Kentucky on the basics of hemp production drew much interest. Brent Burchett, director of the Kentucky Department of Agriculture’s Division of Value-Added Plant Production told Bowman, “We go through KDA’s rules, the hemp program operations, a little bit of the long-term aspects of the industry, some of the uncertainties we’re dealing with and some of the challenges of growing so fast, so quickly." Prior to World War I, hemp was grown in Kentucky for products like rope and ship sail material, Bowman writes. "Following the second world war, availability of inexpensive synthetic fiber further discouraged the growth of the crop." This year, KDA approved 12,800 acres for inclusion in the pilot program, up from 4,600 acres in 2016, Bowman writes. "Both Burchett and Keene stress that this is still a heavily regulated and monitored project. Not just anyone can go out and plant a field of hemp." Industrial hemp is still on the same list as heroin, morphine, cocaine and other illicit drugs as a "one controlled substance," Burchett told Bowman. "It’s a serious undertaking to import seed and check it in with KDA before growers receive it. When planted, producers must submit the exact GPS coordinates for the crop," adding that 12,800 acres will have to be physically visited by KDA staff this year. While President Trump has held photo-ops for most of the laws and orders he has signed, behind closed doors on Tuesday he "quietly signed a measure that killed a regulation enacted by the Obama administration to tighten gun background checks," James Hohmann reports for The Washington Post. That same day he publicly signed two other resolutions. "The rule required the Social Security Administration to send over the names of people who receive government checks for being mentally disabled and others who have been deemed unable to handle their own financial affairs to the FBI office that runs the national background check database," Hohmann writes. "This is a universe of about 75,000 people. The National Rifle Association says the rule curtails the Second Amendment rights of these people and persuaded GOP leadership to use the Congressional Review Act to undo it. Under the Constitution, Trump had 10 days to sign off. By waiting until the day before the deadline to do so, when there were so many big stories in the mix, he ensured it got minimal coverage." 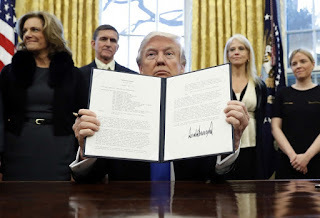 Hohmann notes, "In a normal time, with a conventional president, undoing this regulation would have been front-page news. Trump’s move would have sparked a national conversation about the country’s continuing failure to seriously address both gun violence and mental illness. Major publications would have run deeper stories about how flawed the national background check system is five years after the massacre at Sandy Hook, with an emphasis on the gun lobby’s role in keeping it that way." "But in the current news environment, with the Trump administration running a blitzkrieg offense and the attorney general embattled for concealing secret meetings with the Russian ambassador while under oath before Congress, it’s very hard for anyone to stay on top of everything," he writes. "Not only does the media have limited bandwidth, but cable producers are always reluctant to give much airtime to issues that don’t have obvious visuals." A federal appeals court on Friday ruled that "wolves in Wyoming should be stripped of Endangered Species Act protections and management given to the state rather than the U.S. government," Laura Zuckerman reports for Reuters. 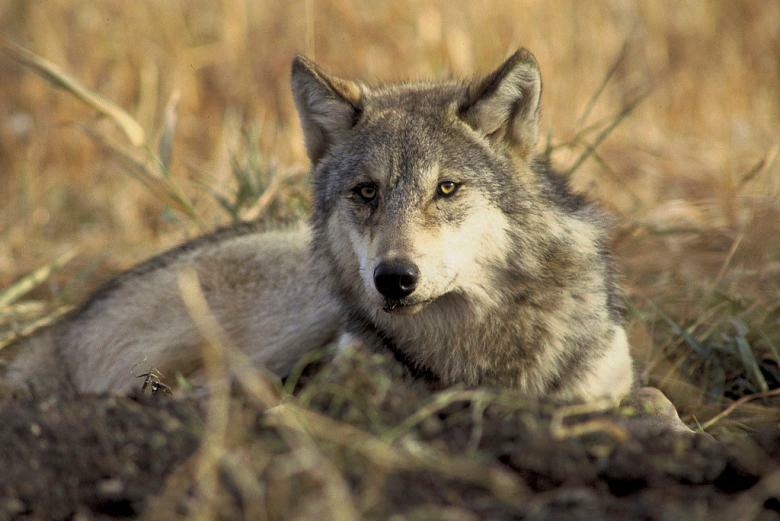 The decision could open the door for hunting of wolves. "U.S. wildlife managers in 2012 determined that wolves in Wyoming had rebounded from the threat of extinction and that the state plan to oversee the creatures was adequate to ensure their survival," Zuckerman writes. "But conservation groups sued, contending the U.S. Fish and Wildlife Service had acted in an arbitrary and unlawful fashion in finding Wyoming's plan acceptable. They argued the state would fail to maintain the animals at certain population levels and would subject a portion of them to being shot on sight." "A U.S. district judge sided with environmentalists in a 2014 decision and the several hundred wolves in Wyoming were once again placed under federal safeguards," Zuckerman writes. "The state, U.S. Fish and Wildlife Agency and others appealed that ruling and, on Friday, the U.S. Court of Appeals in the District of Columbia reversed the lower court, finding that the U.S. Fish and Wildlife Service had indeed 'exercised its judgment in a reasonable way' in concluding that Wyoming's management plan would provide wolves with sufficient protections."